2 (b) A retaining wall 2m in height has a smooth vertical surface. The backfill has a horizontal levelled surface with the top retaining wall. The density of backfill is 18kN/m3 shearing angle of resistance is 30 degrees and cohesion is equal to zero. A uniformly distributed surcharge load of intensity 30 kN/m2 is acting back fill. (i) Calculate the magnitude and point of application of active earth pressure per under length of the retaining wall. 4 (a) A square column foundation is to be designed for a gross allowable total load of 300 kN. 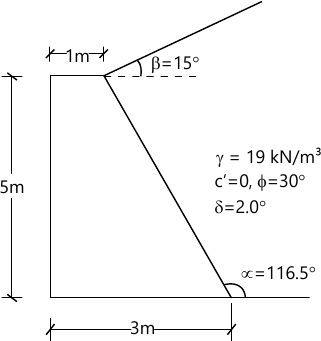 If the load is inclined at an angle of 18° to the vertical determine the width of the foundation. Take a factor of safety of 3.0 and use vesic's equation. 4 (b) The gravity retaining wall as shown in figure supports a granular backfill. The unit weight of the material is 25 kN/m3. The angle of friction between the wall and the back fill,δ=20° and at the base of wall δ1=23° the allowable soil pressure is 300 kN/m2 Ignore the passive resistance at the toe of the wall. ii) Factor of safety against overturning. iii) Factor of safety against bearing capacity failure. 5 (b) A concrete pile 350 mm diameter is driven into dense sand for a depth of 8.5 m Estimate.